Owen at The 49’r, Nov. 25, 2002. 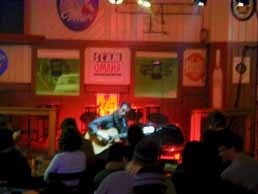 Last night’s Owen show at The 49’r has to be a new low in terms of rude Omaha crowds. I’ve heard about how loud the chatter was at the recent Cowboy Junkies show at The Music Box. That couldn’t have come anywhere close to what happened last night. The evening’s festivities began with an ear-piercingly loud set by Omaha’s Sound of Rails, a three-piece indie-art instrumental outfit in the Pele / Euphone / Sea and Cake / Tortoise style. They were so loud that you couldn’t really talk to the person standing next to you, which is to be expected from their style of post-punk rock. Not exactly a complimentary opening act for what was about to follow. After their set ended, Owen, a.k.a. Mike Kinsella, took a seat and began strumming his acoustic guitar. Though the sound guy did as good a job as anyone could in those conditions, Kinsella’s quiet set was blanketed under the ocean of crowd noise — not chatter, not idle talking — out and out yelling, laughing, that sort of thing. There was Kinsella, head down, looking at his shoes, playing some amazing guitar and singing his broken-hearted songs amidst a sea of noise akin to a college football crowd (it was no coincidence that the 49’rs/Eagles game was playing on a TV over the bar). I had a feeling this might happen (note the question about handling crowd noise in my Owen interview), especially having heard how inattentive the crowd is at the Niner’s acoustic nights. “I’ll give you a dollar if you stop talking,” he said as he noodled absentmindedly. The crowd, however, continued to rumble. “If you be quiet I’ll sing you a song about my ex-girlfriend.” No response, no acknowledgment that he even said anything. No matter. Kinsella started playing “The Ghost of What Should Have Been,” but it was hopeless. That was probably the breaking point. Kinsella gave up and began a night of covers that eventually turned into a karaoke free for all. He asked the crowd if they liked Bon Jovi. Whoops all around, clapping. He fiddled around until he found the chords to “Wanted Dead or Alive” and everyone went nuts, eventually singing along with him during the chorus. Kinsella had raised the white flag. What choice did he have? I don’t know if that broke the tension or not. I can vouch that he was smiling and laughing at times from the stage, though I don’t know if he was laughing with or at the crowd. Regardless, the noise didn’t dissipate at all. “You guys like Oasis?” More whoops. Kinsella asked for someone from the crowd to come up and sing, and sure enough, up came Race for Titles’ drummer Matt Bowen along with a couple other people. Kinsella took one look at Bowen and began playing “Disarm” by Smashing Pumpkins. Someone else handled the vocal chores. For the next 20 minutes or so, Kinsella accompanied 1) Bowen and company singing Oasis’ “Wonderwall,”, 2) Bowen doing an admirable Thom Yorke impression on “Fake Plastic Trees,” 3) Matt Whipkey singing Springsteen’s “I’m on Fire” (which, by the way, he dedicated to Timmymac). The medley ended with someone singing Jane’s Addiction’s “Jane Said.” And that was it, Kinsella put his guitar away. Was it a disaster? Probably for any Owen fans who might have come to hear Kinsella play a quiet, introspective set of his own music. That wasn’t going to happen last night. Kinsella just reunited American Football actually. Hopefully someone brings them here.